Like recycling? Or are you an upcycling fanatic? Do you have old toys stored in a closet or live near a children's home with lax security? Then grab those baby dolls, gut the poor creatures, and fill them the pride of Old El Paso. You'll be the talk of the town and/or the subject of a local news segment in no time. As Patrick Swayze might have said, "Nobody puts Baby in the salsa." 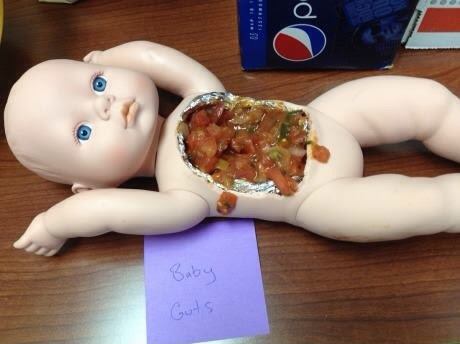 He didn't say anything about putting salsa in the baby, though. Bon appetit!